Hundreds of thousands have taken to the streets of Guatemala to protest corruption and call for the resignation of the president and members of congress. On Sept. 20, hundreds of thousands of Guatemalans demonstrated across the country against President Jimmy Morales and Congress. The protesters demanded the resignation of the president and congressional members, following new accusations of corruption and the repeal of anti-corruption laws passed in 2015. In Guatemala City, student groups and organizations that began during the 2015 corruption crisis marched from different points of the city to the Central Plaza in protest of the president and Congress. Eighty-five miles northwest of Guatemala City, in the largely indigenous department of Sololá, the indigenous authorities of the municipalities of Sololá, San Pedro la Laguna, San Juan la Laguna, Nahualá, Santa Catarina Ixhuatan, San Lucas Tolimán, Panajachel, and Santiago Atitlán organized a department-wide protest, blocking the Panamerican highway in Los Encuentros for eight hours. And the protests have already led to major impacts in the government. Key governmental ministers have resigned, including those running the Ministries of Labor, Finances, the Interior and Health. The impacts of corruption are especially felt within the indigenous communities across Guatemala. Sololá is among the departments with the highest populations of indigenous peoples, and it is also among the poorest departments in Guatemala, with 85.4 percent of the population living in poverty, according to a 2016 report from the United Nations Development Program. According to the same report, the department also has low access to education and healthcare. These direct impacts of corruption have mobilized the communities to protest. The actions add to the growing outrage following Guatemala’s latest political crisis, which began weeks earlier. On Aug. 25, Morales traveled to New York to meet with U.N. Secretary General António Guterres. During the meeting, Morales and his associates complained about the actions of Ivan Velásquez, the Colombian-born lead investigator of the U.N.-backed International Commission Against Impunity in Guatemala, or CICIG. They argued that the actions of Velásquez were impeding Morales’ mandate as president. Days later, on Aug. 27, upon returning to Guatemala, Morales issued a video on social media declaring Velásquez a “persona non-grata,” and ordered his immediate expulsion from the country. He argued that Velásquez had meddled “in domestic affairs, which are the sole responsibility of the Guatemalan state.” The same day the presidential decree went before the country’s Constitutional Court, which overturned Morales’ decision to expel Velásquez. “We have gone out to the streets to demonstrate because we do not want to see Velásquez go, and a new commissioner come in and drop the cases against those officials that face legal charges,” Solaj said. The attack on Velásquez was viewed as an assault against indigenous communities and the struggle against corruption, since the lead investigator of CICIG is widely viewed as being a “friend” of the people. Analysts suggested that the actions of Morales were an attempt to derail the case that CICIG and Guatemala’s Public Prosecutor office were building against the president. But despite the attack, the case moved forward, and as Morales met with the secretary general of the United Nations, Velásquez and Attorney General Thelma Aldana, issued their findings against the president. In a press conference on Aug. 25, the investigators showed that the president’s National Convergence Front political party had received $325,000 in anonymous donations, and failed to declare $600,000 in campaign expenses. They recommended stripping Morales of his presidential immunity, and filing official charges against him for violating campaign financing laws. The decision to strip the president of his immunity went before the Constitutional Court on Sept. 4. The court decided that Congress should be the body to decide to strip the immunity. The vote went before Congress on Sept. 11, with 104 of the 158 members voting to maintain the immunity. 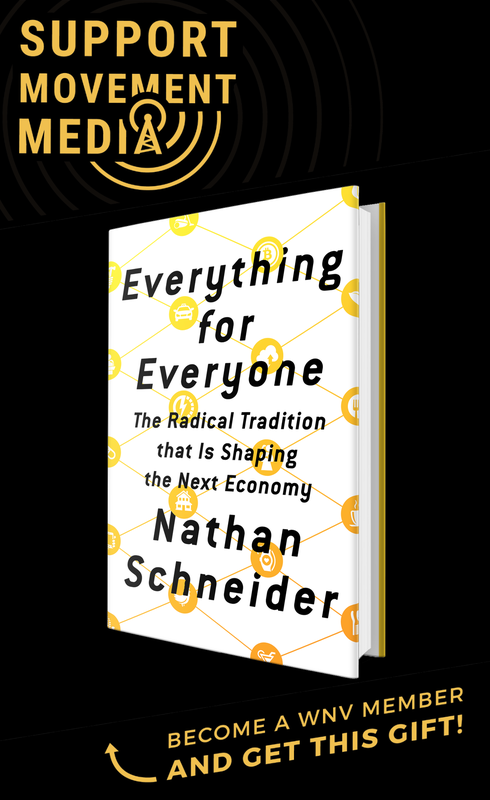 Two days later, using the argument of a national emergency, Congress passed decrees 14-2017 and 15-2017, undoing previous anti-corruption legislation and eliminating prison time if convicts could pay a fine. These actions only added to the popular outrage and led to the national strike. The reforms to the laws were repealed on Sept. 15, Guatemala’s independence day, amidst intense protests. Angry residents of Guatemala City blocked congressional members as they tried to leave, leading to a violent eviction of protesters by riot police. The mobilizations and organizing have taken on different forms within the country. Initially, the urban sectors were slower to join the protest against the president and members of congress. But following the passing of the decrees on Sept. 11, urban residents quickly joined the protests. Within indigenous communities, the Ancestral Authorities have played a critical role in mobilizing the residents that they serve. The indigenous authorities form an alternative government within the communities across the country that has existed for centuries. Their structure is based on the social organization of the Pre-Spanish Mayan communities. This structure has led to an organization that stretches beyond just the town of Sololá, and now includes nearly every municipality in the department of Sololá. These efforts have led to a department that is becoming increasingly organized behind the indigenous authorities. The political crisis in 2015 that led to widespread protests, and the eventual resignation and arrest of President Otto Pérez Molina, his Vice President Roxana Baldetti, and many high-ranking officials contributed to the all too apparent need to reform the Guatemalan government. While some groups have called for a popular constitutional assembly to found a new state, legislators have debated a reform package for the country’s judicial sector within Congress since mid-2016. But these efforts have been plagued by further corruption, foot-dragging and racism. In November 2016, a reform package went before the Guatemalan Congress for debate. 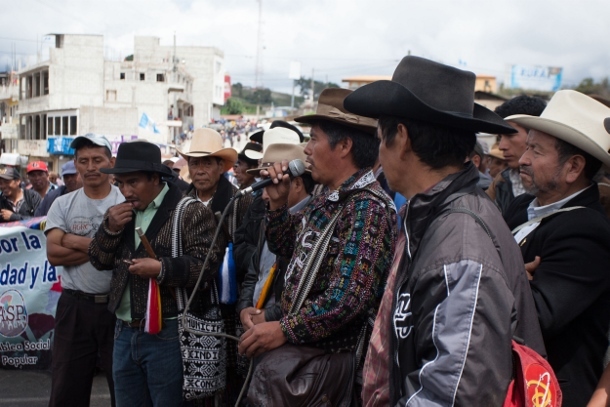 Among the reforms were changes to the law that governs political parties, as well as the the legal recognition of the judicial authority of the indigenous Ancestral Authorities across Guatemala. The reform of Article 203 would have opened the door to the formation of a plural national state, where the indigenous authorities would have the autonomy to administer justice within their communities. 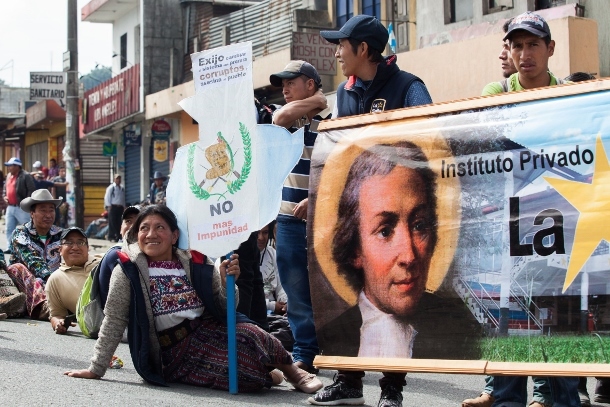 One of the key aspects to the reform was that no judicial bodies in Guatemala — except the Constitutional Court — could contradict or revise the decisions of the indigenous authorities. And the indigenous authorities in turn could revise the decision of the Constitutional Court. But there was bitter debate over the reform within Congress and the national media. Specifically, commentators raised concern over the recognition of the indigenous authorities. This led to extensive accusations of racism during these debates. 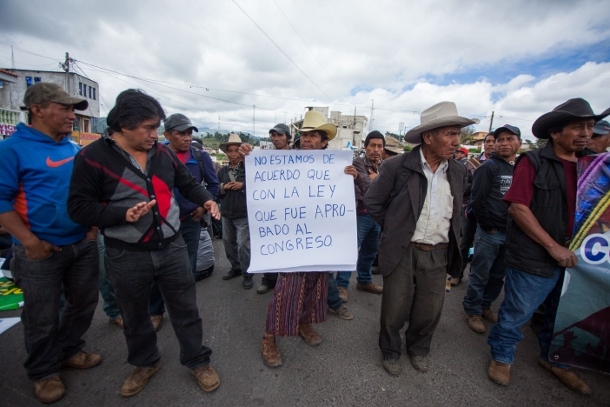 Indigenous authorities were repeatedly blocked from entering Congress by congressional security. 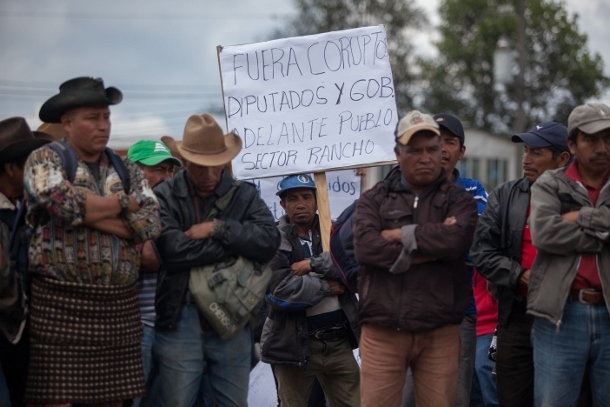 Among the most vocal critics of the reform were the members of the Coordinating Committee of Agricultural, Commercial, Industrial and Financial Associations, or CACIF, Guatemala’s notorious business association made up of the most powerful families in Guatemala. In February 2017, CACIF asked Congress not to approve the reforms, stating that the approval of the law would lead to further division between indigenous and non-indigenous communities. On March 6, the indigenous authorities held a press conference in Guatemala City to announce their decision to withdraw the reform to Article 203. Their reasoning was that by doing so, they could save the reforms as a whole. But, in spite of ending their push to change Article 203, the entire reform package has stalled. In response, the indigenous Ancestral Authorities of Guatemala announced their repudiation of Congress on March 23. Saloj points out that the main issue is that members of Congress do not even follow the laws that they themselves speak of. Hurray! More power to the people ! I an extremely happy to finally see the Indigenous population unite and rise up without fear! Hopefully the rest of the diverse mix of people in Guatemala will unite for this most worthy cause!! Thank you for posting this. I don’t see this kind of news in the media here.